Uber, the ride-hailing service, is normally not going to blog excitedly about how something is reducing the use of Uber. But they did say that recently, because the thing reducing Uber use is JUMP, the dockless electric bike service Uber purchased. Overall trip frequency (Uber + JUMP trips) increased by 15% after their first JUMP ride. The entire increase can be attributed to the use of eBikes; Uber trips actually declined by 10%. During the workday (Mon- Fri, 8a-6p) when congestion is at its worst, this decline in early adopters’ Uber trips was even higher, 15%. To sum up, eBikes were popular with these early adopters and some Uber trips, especially during congested periods, were replaced by JUMP trips. This is a promising early sign of the ability of eBikes to alleviate congestion and reduce car trips. The fact that demand for eBikes is currently constrained by limited supply (there are only 250 JUMP bikes in San Francisco) makes this all the more promising. I appreciate that our region has a variety of travel options. You can take a train or bus, Zipcar or car2go, Capital Bikeshare, dockless bike, or electric scooter. Increasingly, though, I'm excited about the potential for e-bikes to help get DC toward its goal of 25% walking and biking mode share (up from 17.6% today). Bicycling is great exercise, more efficient use of road space, and just cool. But a common refrain is, it's not for everybody. People who live on hills and aren't that fit can't realistically use it to commute. People who need to dress up for work and don't have showers at the office will get too sweaty, especially in the summer. I personally have a back injury and more than a little bicycling causes pain. There are still huge numbers of people who could be bicycling but don't for other reasons, such as: the streets don't feel safe. This can change, and should, and many more people may use human-powered bikes. Even so, we now have a service which shows a solution for the people with back injuries or big hills or dressy work clothes or even sometimes high-speed streets, and it's JUMP. Soon after JUMP launched, I rode one of the bikes out to JUMP's warehouse in far Northeast DC, off Rhode Island Avenue near the Maryland border. Coming from downtown, I started taking the route Google Maps recommended for someone on a bike: Q St NW to 1st St NW to R St NE to the Met Branch Trail. The blue line marks the recommended route to JUMP's warehouse, but Rhode Island Avenue is more direct so I took that instead. Image created with Google Maps. This is a perfectly good route, and there's nothing wrong with it. (Except you aren't allowed to ride an e-bike on a trail right now, though.) But I was slogging through stop sign after stop sign on Q Street and then said, the heck with it, let's just take Rhode Island Avenue. There are probably two main reasons you don't take Rhode Island Avenue on a bike normally. First, there's a massive hill. And second, it's three lanes of cars each way. My point is this: For people taking longer trips where cycling isn't a great option for them personally (such as for me), something like JUMP works great. Take any major avenue. Add a bike lane and e-bikes. We recently had a post about Connecticut Avenue, where two local Advisory Neighborhood Commissions have asked for a study including maybe removing the reversible lane and adding a protected bikeway. 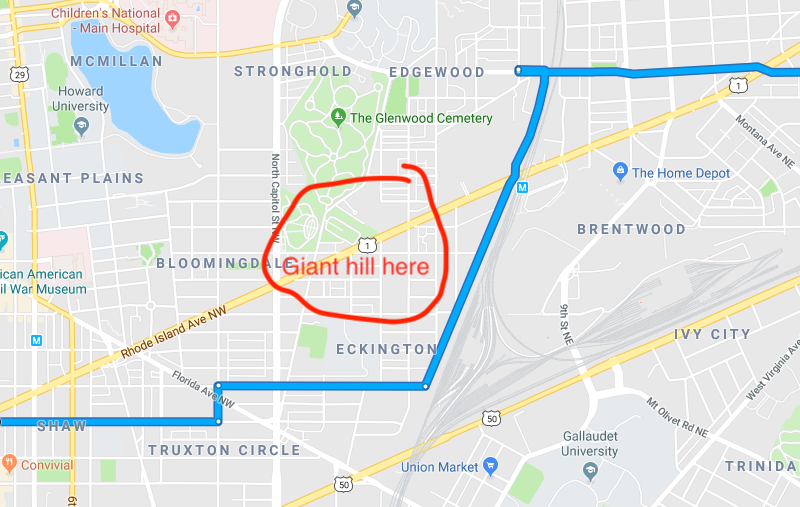 Some commenters pointed out that Connecticut Avenue is pretty hilly, and thus might not be so appealing to everyone bicycling. First off, while that might be true, there are still a lot of people who would bike it. One nice thing about DC's hills and commuting is that the jobs are downhill and the houses uphill. That means you can bike downhill in the morning without getting so sweaty, then get a workout going home where you can shower afterward. A protected bikeway would likely move the needle quite a lot on the mode share there. But this won't work for everyone. (Nothing will work for everyone, of course.) With e-bikes in the mix, however, it could work for a lot more people. JUMP-ing along Connecticut in a protected bikeway would be a viable mode of travel for a great many residents of that area. The same goes for every other DC state avenue, such as Wisconsin, Georgia, New Hampshire, Rhode Island, New York, Minnesota, Pennslvania, and MLK. (OK, state avenue or transformational-historical-figure avenue.) It would also work for other long-distance streets. For those east of the Anacostia or west of the Potomac, the other sides of the rivers are quite hilly and you have to cross big bridges to get downtown. Better protected bike facilities on those bridges are sorely needed, but I think e-bikes also can bring a new transportation mode to many more people. JUMP only has 400 bikes in DC, the maximum allowed under the current dockless bikeshare pilot. And the right total number of docked and dockless bikes is more like 20,000. DC should allow JUMP to expand further, which it now is more likely able to do with Uber's capital resources at hand. Also, sadly, there are some reliability problems. In the last seven trips I've taken on a JUMP, there were problems with five of them. Twice, the motor just didn't kick in, and I either continud the ride without it (one time when it was mostly downhill anyway) or abandoned it. Three times, I reserved a bike on the app but when I got there, the control panel wasn't properly connecting to the central server and couldn't fulfill my reservation, nor could I reserve it anew from the panel. I'm confident these will get fixed, at least as long as Uber/JUMP find it profitable to operate in the DC market. Apparently, Motivate, the operator of Capital Bikeshare is also working on an e-bike offering. Motivate is now owned by Lyft. A competition between Uber and Lyft to provide the best e-bikes throughout DC and the region is ride-hailing market share growth we all should be excited about. Electric scooters also have been growing rapidly, and LimeBike, which started out offering pedal-powered bikes, has mainly switched to e-scooters. Scooters are best for shorter trips. An ecosystem of electric vehicles where scooters serve short trips and bikes serve long trips (and maybe rentable electric cars serve trips which need cargo hauling capacity?) makes sense. Protected bike lanes are critical for bikes and also scooters, since right now scooters riders are somewhat awkwardly either competing with pedestrians on the sidewalk or braving what might not be such safe streets. Do you use e-bikes or scooters? What else do you think can get DC to its goal of 25% walking and biking trips by 2032? Correction: The initial version of this article said that JUMP had not yet reached the 400 bike limit. Colin Hughes, JUMP's DC general manager, says that JUMP recently reached the 400 bike mark. This article has been corrected.